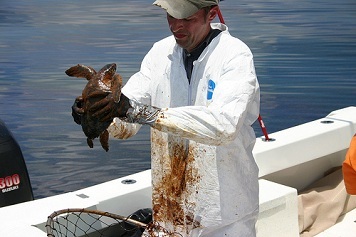 A NOAA veterinarian prepares to clean an oiled Kemp's Ridley turtle. As part of the NRDA process, NOAA assesses injuries to marine life. After an oil spill or hazardous substance release, response agencies such as the U.S. Environmental Protection Agency or the U.S. Coast Guard lead efforts to control and clean up the substance in order to eliminate or reduce risks to human health and the environment. However, these efforts may not fully restore injured natural resources or address their lost uses by the public. This is the point when a Natural Resource Damage Assessment may become necessary. Several federal laws charge NOAA and certain other federal agencies, states, and Indian tribes—collectively known as trustees—with evaluating the impacts of oil spills, releases of hazardous substances, and ship groundings on public natural resources. NOAA is a federal trustee for coastal and marine natural resources, including marine and migratory fish, endangered species, marine mammals, and their habitats. Natural Resource Damage Assessment (NRDA) is the process that NOAA and other trustees use to study the effects of these incidents on fish, wildlife, surrounding habitats, and public use of those resources. Scientists work together to identify the extent of natural resource damage and specify the type and amount of restoration required. As a result of environmental injuries caused by hazardous release from a battery manufacturing facility, East Foundry Cove Marsh (N.Y.) required replanting. 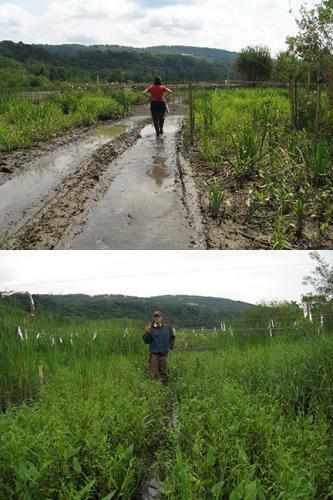 The upper photo from Aug 2, 2010, shows areas before the planting while the lower photo was taken one year after planting emergent plants. Although the concept of assessing and restoring environmental injuries may sound simple, understanding complex ecosystems, the services these ecosystems provide, and the damage caused by oil and hazardous substances takes time—often years. The season and location the resource was injured, the type of oil or hazardous substance, and the amount and duration of the release are among the factors that affect environmental assessment and restoration. Rigorous scientific studies may be necessary to prove injury to resources and natural resource services in a court of law. The responsible party, when working cooperatively with the trustees, may be a key participant in assessing injuries and implementing restoration. The responsible party pays the costs of assessment and restoration. The NRDA process ensures an objective and cost-effective evaluation of injuries to American natural resources—and that the public's resources are fully restored. Primary restoration returns the impacted resources to the condition that would have existed if the incident had not occurred. Compensatory restoration addresses losses from the date of injury until recovery is completed. While the resource is impaired, it is unable to provide services on which other parts of the ecosystem and the public rely (such as fish nursery habitat or recreational use). Restoration projects address the period from injury until recovery. Emergency restoration includes actions taken prior to the completion of the damage assessment and restoration planning process to prevent or reduce continuing natural resource impacts and prevent potential irreversible loss of natural resources. Early restoration is a form of compensatory restoration. If the responsible party agrees, it can be implemented prior to the completion of the NRDA process to achieve restoration more quickly.